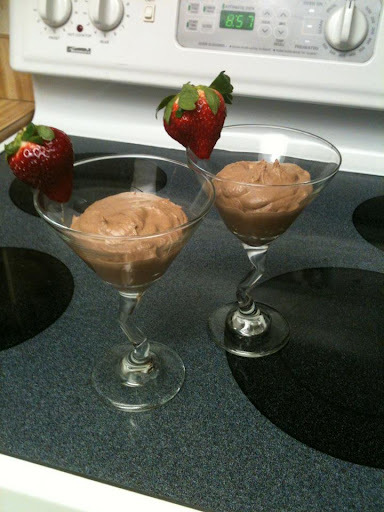 I was really craving some chocolate this afternoon, so decided to make Chocolate Covered Katie’s Dark Chocolate Mousse for dessert. It was the perfect end to a Monday of work and grad school. In a food processor or blender, blend silken tofu until creamy. Add the vanilla, almond milk, salt, and cocoa powder. Melt the chocolate chips in a bowl in 30 second increments stirring in between. Add the melted chocolate chips and blend all ingredients together until well blended and smooth scraping down the sides as needed. You can eat this right away but it tastes best when refrigerated for at least an hour. The longer it sets in the refrigerator, the thicker and richer it tastes. This morning I was in the mood for fruity pancakes and decided to adapt Chocolate Covered Katie’s blueberry pie pancake recipe. Instead of using just blueberries, I added blueberries and strawberries for mixed berry pancakes! They were delicious. Combine dry ingredients in a bowl, then mix in the wet ingredients being careful not to overmix. Cook on an oiled pan over medium heat. Note: I actually didn’t measure the fruits, I just tossed enough in the batter to my liking. 2. In a large bowl, stir together the rolled oats, brown sugar, salt, and cinnamon. 3. In another bowl, stir together agave, oil, and vanilla. Dump this over the oat mixture and combine thorougly using your hands to coat the oats evenly. This should be stored in an airtight container for up to two weeks. I tried this recipe using the applesauce instead of the oil and it turned out fantastic. 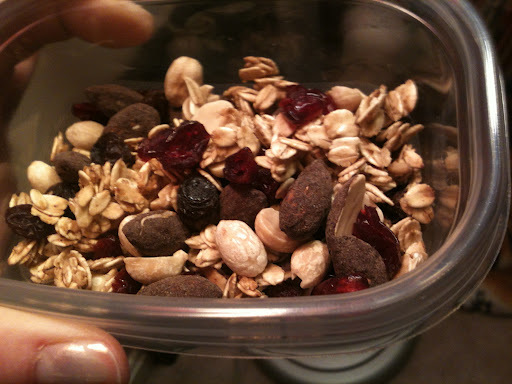 After I made the granola, I decided to take about 1/4 cup of the granola and add: unsalted cashews, raisins, craisins, and dark cocoa almonds by Emerald to make my trail mix. Any combination works, but I definitely recommend adding a few dark cocoa almonds. It’s a healthier way to get that chocolate taste in your trail mix, and when it’s mixed with everything else it has an amazing taste!